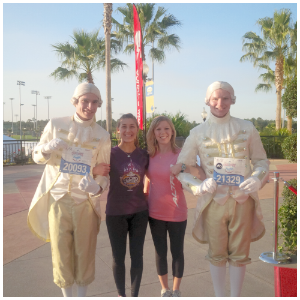 I have only ran with a running group one time. It was several years ago and I was invited by a new running friend (who has since moved out of state). 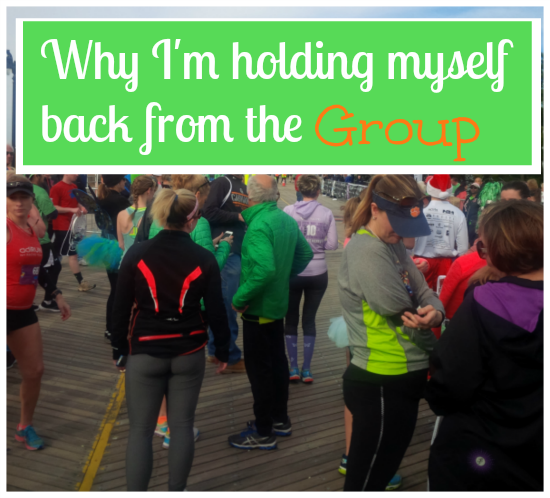 I was training for my first half marathon so I thought going to the group was a great idea. Now this was several years ago and I don't remember all the details but I think we only ran 4 miles that day. It was a challenging course (lots of hills and we came to a road block when there was a stream in the middle of the road and the bridge was down), but I was proud of myself that I could keep up with the group. Everyone was so friendly and they even had refreshments when we all met back at the park afterwards. I always meant to go back to this running group except for the fact that it wasn't located in my town and later that summer my running friend who invited me moved. Okay, maybe those aren't good excuses but they worked at the time! Over the years I would read (on blogs) about people running with their running group and all the fun they would have. I would comment that I needed to find a group to run with, that was my mission. It just so happened that over the past year I had found a local group that I was invited to be a part of. I had gone to one or two of their events but never ran with them because of the pesky injury. Then a few weeks ago I was invited to the group to participate in a Mizuno shoe demonstration with the Mizuno rep. You all know how much I love my Mizunos, so I definitely wanted to show up for that. I had planned on meeting up with the group early that Saturday morning, but it ended up that I was very tired on Friday night and the thought of getting up to be at the running group earlier than I would even have to get up for work did not appeal to me at the time. Recently I was invited to a second local running group. I had wanted to try this one out too but just hadn't made it there yet. Then it occurred to me. I knew why I wasn't pushing myself to go to these groups. You may agree that marathon training is a very personal thing. Everyone does it differently. This training cycle, I am even doing things differently than I did last time. I am not running nearly as much as I did last year, but I am making each run count. I enjoy running by myself. I like running at my own pace. I don't want to feel like I am holding other people back, nor do I want to feel obligated to run at a slower pace. My long runs are on Saturdays so that prevents me from running with the Saturday morning group. After the long run on Saturday, I don't feel like running with the Sunday group either. Perhaps if I were training for the Goofy Challenge again this would be more appealing! I do my short run during the week and then go to physical therapy on the other days, so perhaps I really wouldn't have time to do a group run anyway. I love my running group, but totally understand where you are coming from. After such a long stretch dealing with an injury, I probably would be training on my own too. I also think that during marathon training it is important to do your training runs at your own pace and not try to keep up with others. I hope I see you in January sometime before or after our big race! Yes, we hope to see you too during marathon weekend. I'm training this time around for a specific reason and specific goal. Perhaps during a different race I may give the group a try! I have often thought about joining a running group, but I really don't think it is for me. For me, running is my alone time and I don't want to give that up. I had a running group I ran with before I moved, and I still occasionally make the drive down to run with them. There are a few groups around where I live now, but I haven't gone running with them yet. I'm so comfortable with my old group and there are so many unknowns with a new group. What if they're way faster/slower than me? What if I can't find the place they meet up? It's hard to step out of my comfort zone to get to know a new group. I think running groups can be kind of intimidating, especially when you don't know who they are! I used to do my long runs with a group all the time and it was so much fun! I made running friends who have turned into "normal" friends haha. But I have not run with that group in several years. They don't meet that often, so it's not like I would have an opportunity every weekend or anything, but I have just got into the habit of doing my own thing.. Sleeping in, running later, etc. Like you, I also enjoy going at my own pace and running my own run- not feeling like I have to speed up to stick with someone or slow down to stick with them. I am sure I will go back to running with a group again, but right now, running alone is working for me. I started running with my local running store's running club this year. I did it mostly as a challenge to myself because I have a hard time trying new things and wanted to get out of my comfort zone. I'm so glad that I did, because now I run with them every Wednesday. This is always my "easy day" and I like to take it slow and chat with my new friends in the club. I understand why you aren't joining now, but I hope you'll try it out when you're not training! I would like to join for "social" reasons and to have some people to run with for "easy" runs! I'm not much for running with a group. I like to get lost in my thoughts and run my own pace. I don't run with a group for your reasons. I ran with my team in high school and college and it wasn't fun. We're all at different paces so some were running easy, some were running hard, and there was no talk or anything. I run on my own so I can run my own pace and not worry about losing the group. I haven't joined a running group myself, for many of the same reasons that you've outlined. I don't ever want to feel like I'm being pushed to run beyond my limits, or that a group is holding me back either. I seem to do well knowing what I am and am not capable of. I have tried the group thing twice and honestly it did not work out to well for me. There is something to said about going at what pace is comfortable and pushing or slowing down when you want. I really want to make some running friends because my "real" life running buds are very limited, but it does seem to be in the cards for now. I have a group here that meets every week throughout the year (you joined us once). While I do love the group, it was hard last year to join in training for the marathon. Everyone was training for a half in November and just wanted to do short runs through the holidays. It's even harder with Dopey, so it is a very fair thing to not want to join up when you are training for something completely different. But I do love joining them when I'm not training for something different. You should defiantly check them out after the marathon. I loved that you invited me to your running group. I think the comradery is encouraging! I would run with you! I am such a solo runner, so I totally get you on this! I have so many friends locally who run both solo and in groups and if I wanted to I could pick a group just a tad faster than I run and go with them. In fact I have a lot of friends locally who are pace group leaders and travel around and lead the pace groups around the country. But its never really been appealing. In fact even if I come across a friend on a trail that normally I would chat to for hours, we just nod and say hello and pass. Some people need others, others just need themselves, there is no right or wrong way that is the beauty of it. I have a hard time with running groups, too. I feel way too slow and then I run harder than I should, so I burn out quickly. I've never tried a running group. I'm not necessarily opposed to it, but for me running is kind of "me" time, so I'm not sure I'd want to go running with more than one person. I don't run with a running group but I do run all of my long weekend runs with my roommate's mom and sister who are put of a running group. This particular running group is not free and I would not be able to afford it at this time. I'm not opposed to running with a group but I also don't mind running by myself or with only a couple of people. That's interesting, I haven't heard of running groups that you have to pay to join. Ive never been part of a running group- it sounds like it could be fun but I find it much easier to just stay focused on my own training and run when and where I want to! So I am one of those that are part of a group and love love love them! They have become part of my social life in a way I never imagined. I can also see how that might not be for everyone at every time. I totally get how focused you are on your training and that needs to be something you do for yourself at this time. You never know what the future holds. I am part of two running groups. I lead the Cruisers - a group of about 50 runners, and I'm part of an extremely active group of 775 runners in our local MRTT chapter. There's always someone available for me to run with if I choose! You should give running with a group a try again, but I agree that between training cycles would be a great time to give it a try. 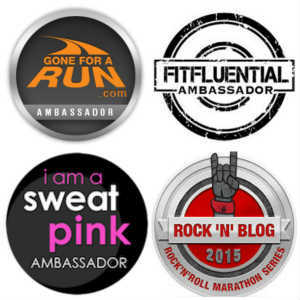 I ran with a group for my first and second half marathons. But for Wine and Dine and for my next half, I'm training without the group. I really liked the group but I'm also enjoying the flexibility of training without a group. And I'm still doing some of my long runs with friends so that helps me get in a mix of social and alone running. And this way, I can do it on my own schedule and with my own plan. I tried a speed training running class with our local fleet feet and it was just "ok". I am glad I tried though! I'm the same as you. When I'm in training, I like doing things my way. When I tried to run training runs with a running group, the group would never run the pace they planned, and I need to run at a certain pace! But, I've run with a group when I'm not training, and I've enjoyed it. I think it works well if you don't have a set pace you're trying to stick to. I used to run with a group...sort of. Until I realized I was never running with anyone because I don't have a very common pace. People are either much faster, or slower than I am. So now I primarily run alone unless a friend invites me to go for a run. I would not like to run with a group all the time or even with someone all the time, I think part of the reason I love running is the alone time with myself! But I do love to get together with friends, and I post often when we get to run together! I'm totally with you on this. I sometimes feel like I'm being antisocial or something, but I have no desire to run with a group. To me, running is super personal...it's my "me" time, and I sort of like the solidarity of it all! Maybe someday I'll give it a try, but when I'm training for something (which is pretty much always, lol), I guess I like to do things my way, haha. This is a FANTASTIC topic. I am with you - I usually prefer to run alone so I can set my own pace, take breaks whenever I need or want, and pick my own route at a whim. I also like being able to zone out and think in solitude. I've run with a group a few times and while there are certainly days when it's helpful, other times I've felt pressured to keep pace, etc. So I do tend to shy away from group runs, too. I love group running. I actually started my own chapter of Moms Run This Town and it was one of the best things I've ever done!